Personalized geometric carry all tote bag. Colorful Moroccan pattern in a blend of gray and hot pink. This lightweight tote bag could be a summer favorite. These bright and bold colors blend together to create an eye-catching effect. The white outlines with white monogram will add a perfect finish. Take it out shopping and fill it with your latest fashion purchases, or to the beach with towels, magazines and pool necessities. 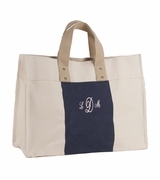 Purchase one for a friend and add a name or monogram included with purchase. Geometric carry all polyester tote measures 20"W x 14"H x 7" across bottom. Lined, with inside zip wall pocket, small 6" x 4" attached accessory pouch. Trimmed in hot pink with web handles, outside zipper pocket and zip closure. Supported footed bottom. This bag looks great and came really early. Very professional monogram. Nice size . I bought bag for my 12 yr old daughter to use as an overnight bag.